Lithuanian-born violinist Rūta’s musical education began in Stafford where she had her first music lessons and played with the Staffordshire Youth Orchestra. 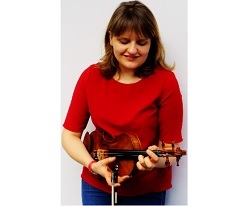 She now enjoys a busy career as a performer and teacher across the UK and Europe. Recently, she completed her Erasmus exchange at the University of Music and Performing arts in Vienna, where she studied under Prof. Jan Pospichal. Whilst in Austria, Rūta worked with the Orpheus Kammerorchester Wien, where she was also involved in a recording project collaborating with composers from Vienna on contemporary compositions. Back in the UK, Rūta is currently in the final year of the CBSO Orchestral Artistry Masters course. She balances her commitments as an orchestral player across London, Birmingham and Manchester. As well as being busy with orchestral work, she is a keen chamber musician, as well as a great admirer of the music of the Viennese composer Erich Wolfgang Korngold. Rūta is combining her two passions in a series of recitals that include several of Korngold’s neglected chamber music pieces. During her free time, Rūta enjoys travelling and exploring new destinations. Last summer, she embarked on a two-week long backpacking trip across northern Europe. She loves experiencing different cultures, languages and cuisine. Rūta played Brahms’ Violin Concerto in D Major, Op. 77 with the Sinfonia in May 2018.